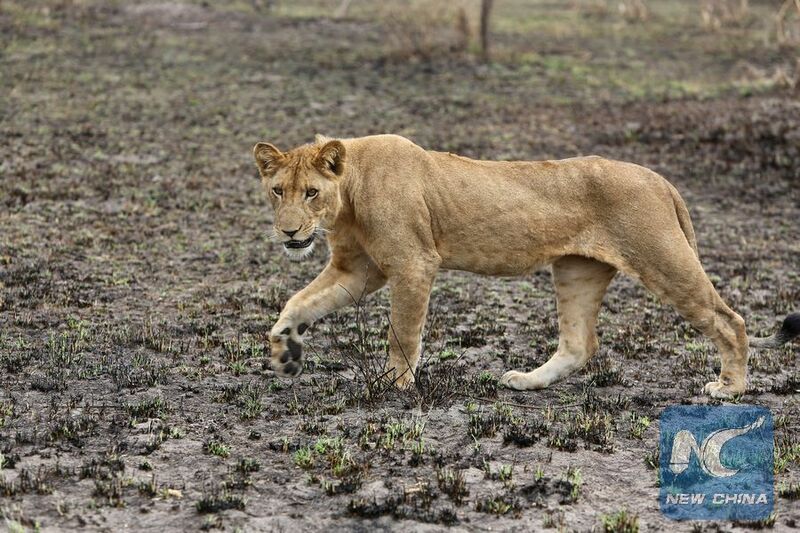 KAMPALA, April 16 (Xinhua) -- The death of 11 lions in Uganda's Queen Elizabeth National Park left many conservationists perturbed on whether the east African country was making progress in saving the big cats. As news filtered in on April 12 that three lionesses and eight cubs were poisoned to death by some elements in a nearby community in retaliation for the killing of their cattle, Ephraim Kamuntu, minister of tourism, rushed to the park, located in the western part of the country. Since then, three suspects have been arrested and the government is threatening to evict the Hamukungu fishing village from the precincts of the park. "Government made a mistake to allow pastoralists in this sanctuary. You are all suspects as per now until you bring us those who keep killing our icons," Kamuntu said, according to the Daily Monitor on Monday. This is not the first time lions are being killed by cattle-keeping communities around the national park. In 2007, 13 lions were poisoned and in 2010, eight were killed. This time around, Kamuntu said, the government is not going to handle the perpetrators softly, warning that if the community does not identify them, the government may resolve that the community stops rearing cattle. In the meeting convened by Kamuntu, the community reasoned that they have lost several animals to lions. The pastoralists argue that despite reporting to the authorities, no action is taken. The United Nations says lions and other charismatic predators are facing many and varied threats, which are mostly caused by human activities. Overall, their populations are declining at a disturbing rate due to loss of habitat and prey, conflicts with people, poaching and illegal trade. Figures from the International Union for Conservation of Nature show that populations of African lions have declined by 42 percent over the past over 20 years. In Uganda, a recent census put the country's count of lions at 420, compared to 1,000 in 1990. UN Secretary-General Antonio Guterres, in a statement issued in commemoration of the World Wildlife Day on March 3, called for personal action to help ensure the survival of the world's big cats and all its precious and fragile biological diversity. According to Uganda Wildlife Authority (UWA), a state agency charged with conservation, the country gets 50 percent of the revenue from Queen Elizabeth National Park from visitors who come to see lions. The agency says out of 10 tourists who visit the park, five want to see lions, meaning that half of the 6 billion shillings (1.7 million U.S. dollars) comes out of lions. Lions and other big cats like cheetahs and leopards are an important tourism attraction in Uganda. They are second only to the mountain gorilla as the most-sought-after species. Tourism is Uganda's main foreign exchange earner. It contributed up to 1.35 billion dollars to the export basket in 2016. Minister Kamuntu says there is need to create awareness about the value of wildlife, especially for the lions, cheetahs and leopard that are under major threat. The public needs to work toward preserving wildlife, as it provides enormous opportunities, especially in tourism, he said. Organizations like the Uganda Carnivore Program are helping to create awareness on the protection of the cats, especially among communities around Queen Elizabeth National Park. Working with the UWA and Makerere University, Uganda Carnivore Program conducts school and community outreaches. On the other hand, the government has enacted policies and laws that promote wildlife conservation. In one of the proposed laws, if one is found guilty of poaching and illegal wildlife trade, they face a maximum sentence of life in prison. The country has also established a dedicated court to deal with wildlife-related crimes.